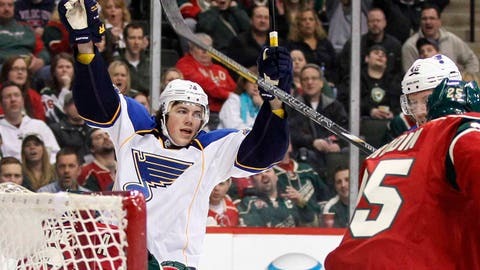 St. Louis Blues right wing T.J. Oshie (center) celebrates a goal on Minnesota Wild goalie Ilya Bryzgalov (not pictured). ST. PAUL, Minn. (AP) — Not even some inside information from Olympic teammate Zach Parise could stop T.J. Oshie in a shootout. Notes: Blues F Magnus Paajarvi was a healthy scratch and was replaced by Chris Porter, who was recently recalled from AHL Chicago. . . . The Wild didn’t register a shot on goal until 7:02 of the first period. 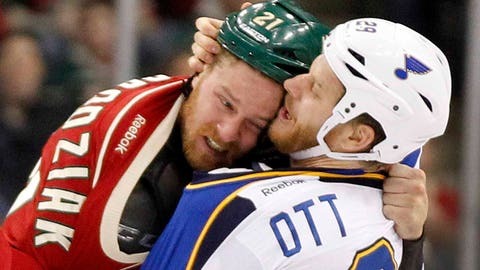 St. Louis didn’t get a shot for the first 12 minutes of the second period. . . . Minnesota’s Kyle Brodziak and the Blues’ Steve Ott fought 2 minutes into the game.